Announced today on Inman.com, HomeServices of America is the number one residential real estate brokerage in The REAL Trends 500 2019 rankings for the first time, ending a twenty-year reign for Realogy subsidiary NRT. HomeServices beat NRT by nearly 10,000 transactions to affirm its position as the industry’s top real estate firm by transaction sides with 346,629 total transactions. REAL Trends tracks brokerages and residential real estate companies for the rankings based on the number of transactions and other metrics such as volume. To qualify for this year’s list, companies had to close 1,992 transactions in 2018. According to REAL Trends, the 500 largest residential real estate brokerage companies in the U.S. closed more than 3.2 million transactions in 2018. “Our repeated recognition as one of the top 50 brokerages in the Berkshire Hathaway HomeServices global network along with this groundbreaking news confirms our alignment, between brokerage and brand, in providing an extraordinary home buying and selling experience for our clients. We’re honored to be affiliated with a strong brand that is strategically and continuously growing in both national and international markets,” said John David Sullivan, co-owner of Berkshire Hathaway HomeServices Beach Properties of Florida. Berkshire Hathaway HomeServices Beach Properties of Florida also ranked in the REAL Trends Top 500 2019 for sales volume. Now in its 32nd year, REAL Trends 500 is considered industry-wide as a benchmark for residential real estate firms performance evaluation. To read the complete article that appeared on Inman.com, Click Here. To download the REAL Trends Top 500 2019 Report, Click Here. 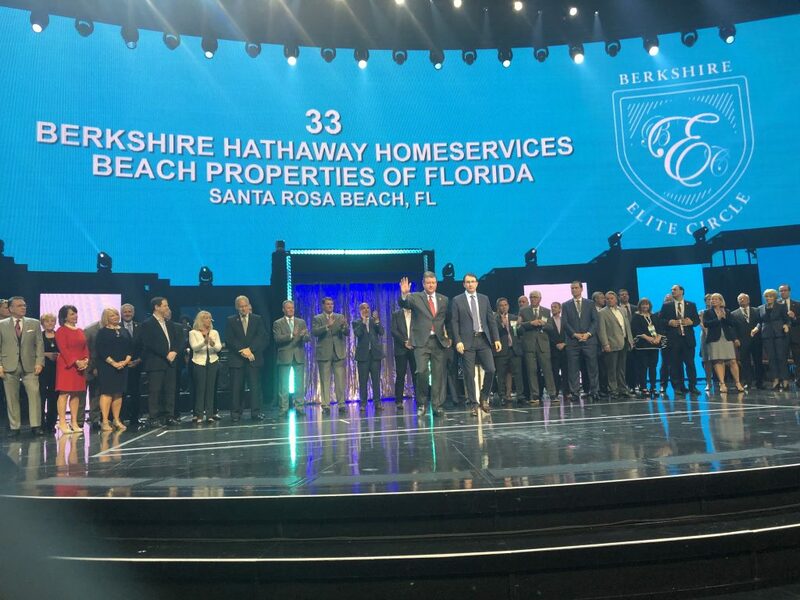 Berkshire Hathaway HomeServices Beach Properties of Florida is honored as a member of the Berkshire Elite Circle for the third consecutive year.